your information to my peers"
ESQ Recruiting is the largest legal recruiting firm in the United States to specialize exclusively on the placement of in-house attorneys. Our legal headhunters conduct searches ranging from general counsels to a company’s first in-house counsel, and everything in between. We offer nothing less than the best legal recruiting services for your entire in-house attorney search and recruitment services needs. Our attorney recruiting services have been used by companies and corporate legal departments of all sizes in a wide range of industries. We successfully recruit in-house attorneys at all levels and across various legal disciplines. It is our national legal recruiting approach, extensive network of legal recruiters, and in-house attorney search specialization that allows us to effectively handle your legal staffing requirements. Established since 2007, ESQ Recruiting has developed an executive legal recruiting network that allows us to provide high-quality legal recruiting services to our clients in every city in the United States. With offices in Atlanta, New York, and Los Angeles, we operate from coast-to-coast with an extensive network of legal recruiters, delivering general counsel recruiting, attorney recruiting, and other professional legal recruiting services. As a legal search firm specializing in in-house attorney recruiting, our vision at ESQ Recruiting is simple: For our attorney recruiters to expertly match your specific requirements to deliver the perfect match. Through this animated portrait let us paint a picture of how we will handle your legal recruiting needs. Find out why ESQ Recruiting is the best legal recruiting firm in the United States specializing in in-house attorney search. 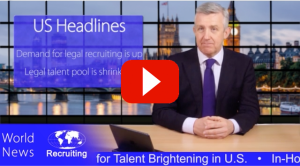 We are a legal recruiting firm with a global reach. ESQ Recruiting has developed a legal recruiting network that enables us to conduct attorney searches locally, nationally, and globally. We do not only recruit across the country through our attorney recruiters located in Atlanta, New York, and Los Angeles, but also through strategic partnerships with local and international legal headhunters that possess extensive knowledge and experience in their specific market. As a result, we are a legal recruiting firm with some of the widest and deepest legal recruiting capabilities anywhere. Find out how our network of legal recruiters can help you hire the right candidate, and deliver the perfect service for your attorney recruiting needs. Attorney recruiters work with a wide variety of attorneys at all levels of an organization. This includes General Counsels (GC’s) who have reached the most senior legal position in their company. For many young lawyers, the level of GC is something they aspire to and set out to achieve during their career. But what advice can attorney recruiters offer to aspiring attorneys seeking to reach these career heights? Attorney recruiters are best placed to see the career development of successful legal professionals. According to attorney recruiters it’s essential that younger attorneys spend some time planning out a career path. This can start as early as when in law school, but can equally be looked at as you move through the first few legal roles of your career. The importance of planning a path to becoming a GC cannot be overlooked and attorney recruiters can help you make those important steps up the career ladder to provide you with the experience necessary for a position as a GC….